Members of the Fort Worth Botanic Garden’s Green Team: Darcy Gustafson, James White, FWBG Director Bob Byers, Rachel Taylor and Brittany Rosenberg. Courtesy of FWBG. City garbage trucks may someday skip their stop at the Fort Worth Botanic Garden, thanks to an ambitious waste reduction effort kicked off by staff this spring. Each year, the 109-acre city-owned garden is the site of multiple tours, concerts, festivals, weddings and other public and private events, attracting thousands of visitors who generate tons of trash. This byproduct of the garden’s operation, however, didn’t set well with staff members attracted to the facility in part because of their value for preserving the natural world, says staff member Brittany Rosenberg. After discussing the garden’s waste volume and what to do about it, the staff formed the Fort Worth Botanic Garden Green Team in March and resolved to make Texas’ oldest botanic garden into Fort Worth’s first zero-waste facility. 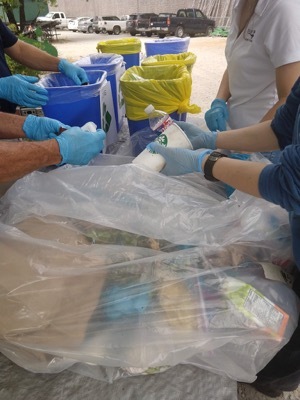 The Fort Worth Botanic Garden Green Team has turned more than half of the park's trash bins into recycling bins. Composed of seven staff members and a consultant under the guidance of Fort Worth Botanic Garden Director Bob Byers, the Green Team sees the zero-waste effort as a fitting mission for the garden to take on, inspiring residents, businesses and other city departments to follow suit. So far, their efforts to reduce waste have partnered the garden with the Welman Project, a Fort Worth-based nonprofit that picks up surplus from local businesses and delivers it to nearby classrooms where items are repaired, reused or repurposed by school children. The Green Team has also coordinated the on-site composting of leftover food, reuse of garden maps, water bottle recycling and copy machine toner recycling while turning more than half of the garden’s trash cans into recycling bins. 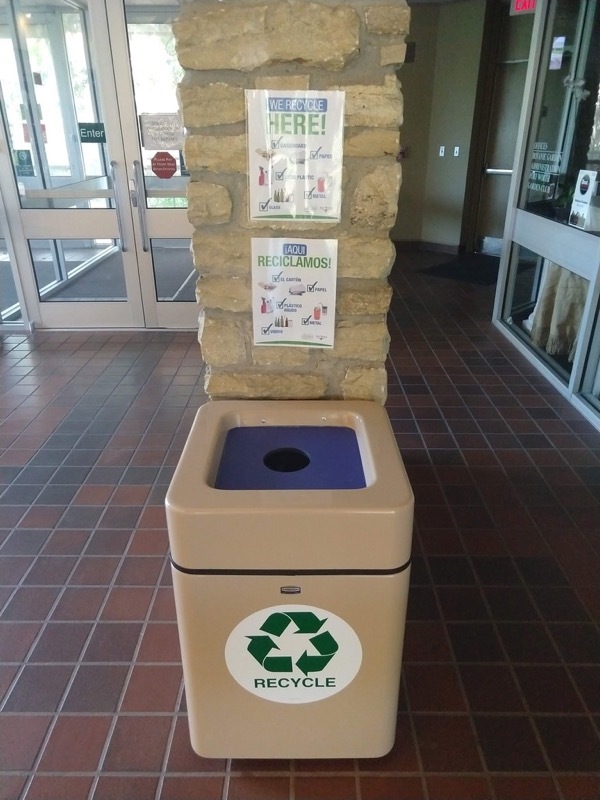 “We are almost finished tripling the number of recycle bins on site and we have increased some signage and branding and are working with administrations to develop more effective signage systems,” Rosenberg says. Rosenberg says already, the garden has diverted as much as 54 percent of its waste stream from the landfill, and that the garden should attain a 60 percent reduction in waste by early 2019. “The main success of the Green Team has been putting sustainability at the forefront of every conversation on new events and procedures at the Garden. People casually stop at each other’s desks to check if something is compostable, talk about a new development in combating sea plastics and are more considerate in their personal choices,” Rosenberg says. 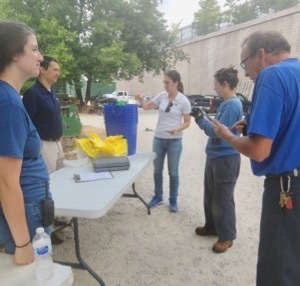 Kelsey Robinson, Sean Stanton, Soria Adibi, Melissa Brown and James White​ perform a trash audit to evaluate the Botanic Garden recycling program’s success. Still remaining a challenge for the Green Team are finding an eco-friendly coffee service and eliminating fish food bags for visitors feeding the garden’s koi fish. Also challenging is an item that Rosenberg feels especially frustrated by. Once the garden has reached its goal, Rosenberg says the mission of the Green team will grow to include outreach efforts to the rest of the city, helping the city’s other departments as well as businesses, organizations and residents to do their share of waste reduction. “In my experience, most City of Fort Worth departments make a real effort to recycle responsibly. Most of what ends up in landfills, in the U.S., is commercial waste. Most of that is often paper and water bottles – both of which are valuable resources that could be resold and repurposed. Any recycling program that Fort Worth businesses are willing to adopt is a step in the right direction,” Rosenberg says. The efforts at the garden have been accomplished without extra funding, and both the garden’s administration and city officials have been favorable to the Green Team’s missions, Rosenberg says. Most of all, the efforts have been well received by the garden’ guests.